PARIS (AP) -- To many Parisians, the letters PUF have always been associated with the intellectual heart of the French capital. So when the 95-year-old venerable publishing house specializing in human and social sciences was forced to close its historic bookstore on the Place de La Sorbonne in 1999, it left a big void in the heart of many students and researchers. But Les Presses Universitaires de France (PUF) is back in town, just a stone’s throw from their previous location in the Quartier Latin neighborhood. While the PUF’s new bookshop is not as big as it used to be, its riches could fill the life of any reader. 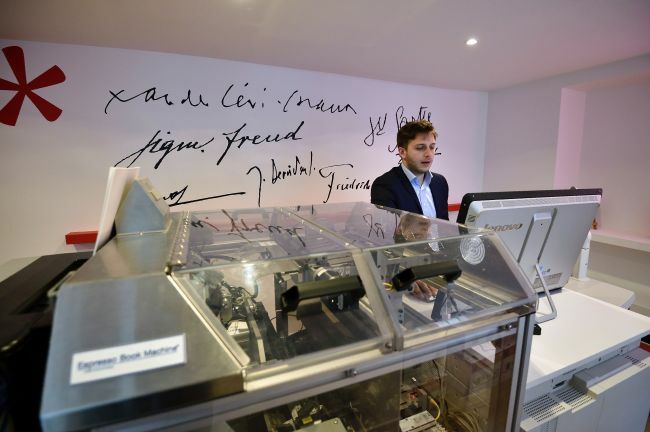 The few books on the shelves aren’t for sale, but around 3 million titles are available in the 72-square meter store, which opened last week. PUF’s comeback in the City of Lights couldn’t have been possible without the Espresso Book Machine, the robot that prints, binds and trims books in a few minutes. Available since 2006, the first one was installed briefly at the World Bank’s bookstore. There are now more than 100 in bookstores and libraries across the world. At PUF, it has been installed at the back of the shop and arouses interest from all kind of visitors. When the AP visited the shop earlier this week, three police officers patrolling the neighborhood were passing by and came in to learn more about books on demand. 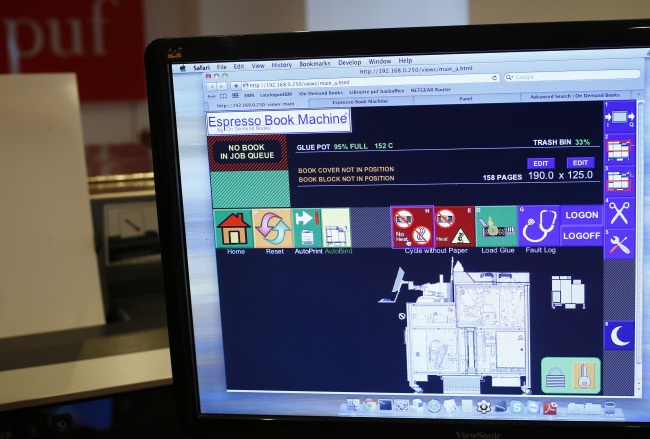 The Espresso Book Machine uses two PDFs, one for the cover and another for the text. While the cover can be printed in color, the inside of the book is black and white only. It takes only a few minutes to create a book. “It’s unbelievable,” says Zeina Genadry, who used to buy books at the historic PUF bookshop, as she flips through the pages of the biography of Montaigne from Stefan Zweig that just came out of the machine. Although the cover of the books are a bit sticky compared to those of traditional paperbacks because of the gloss used during the process, the machine produces library-quality books sold at the same price as in traditional bookshops. According to Meriot, the on-demand-only model that PUF is developing in parallel to its traditional publisher's activities has a bright future. Meriot said he needs to sell about 15 books daily to break even. He sold 60 on the opening day of business. “It was almost a riot, our booksellers didn’t even find the time to take a break for lunch,” he said. For now, about 5,000 titles from the PUF catalog are available at the bookshop, with an extra 3 million titles from other publishing houses and sources put together by On Demand books -- the company behind the Espresso Book Machine -- also printable at the shop.